Star-crossed lovers are torn between clan loyalty and forbidden romance in the Highlands of medieval Scotland. For decades, a feud has divided the Mackintoshes of Clan Chattan and the Comyns of Raitt. Though Raitt Castle lies not far beyond the next ridge, headstrong Lady Catriona “Katy” MacFinlagh of Clan Mackintosh has never seen it. When her curiosity and rebellious spirit compel her to scale a nearby peak in hopes of catching a glimpse, Katy loses her footing, and a broad-shouldered stranger, appearing seemingly out of nowhere, saves her from a fatal fall. Spellbound by the young tawny-haired beauty he has rescued, William Comyn neglects to reveal his full identity to her. As Will and Katy begin to meet in secret and their strong mutual attraction deepens toward love, the clan feud once again erupts in violence, making it harder and harder for Will to reveal that he is a Comyn. But when Will learns that Katy's clan is in imminent danger, he must decide between his newfound love and his sacred honor, and Katy must choose between her pride and her heart. 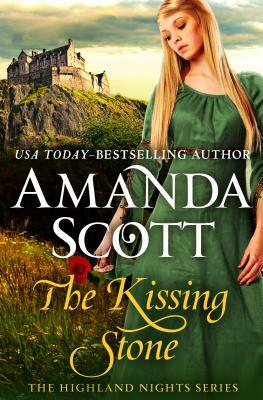 Set in the same north central Scottish Highlands as The Reluctant Highlander, The Kissing Stone is a historically rich and fiercely passionate Scottish romance from the Rita Award-winning author “frequently credited with creating the subgenre” (Library Journal). The Kissing Stone is the 2nd book in the Highland Nights series, but you may enjoy reading the series in any order.